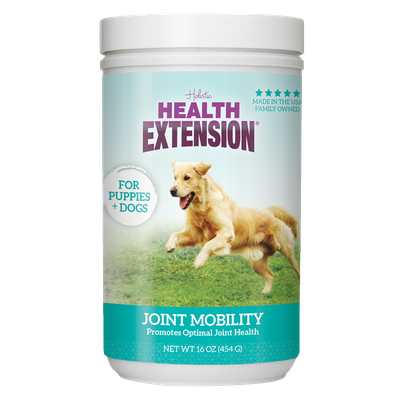 Made from wholesome, FDA-inspected ingredients, this all-natural supplement is carefully formulated to support optimal joint health and comfort in puppies or adult dogs. Simply mix this highly palatable powder into their daily food or sprinkle on top. Customers tell us it does wonders for the mobility of their pets! With kelp, bee pollen and flaxseed! Glucosamine Sulfate, Chondroitin Sulfate, Collagen (from bovine), Hyaluronic acid, OptiMSM, Pureway-C, Vitamin C with Lipids, Desiccated Liver powder + QS, Atlantic Kelp powder, Bee Pollen Powder, Amber Yeast, Brewer’s Yeast, Flaxseed powder, Alcolec, De-oiled Lecithin Granules, Garli-Eze, Buffered Garlic, L. Acidophilus Hardistrain, Calcium citrate, Egg Yolk.